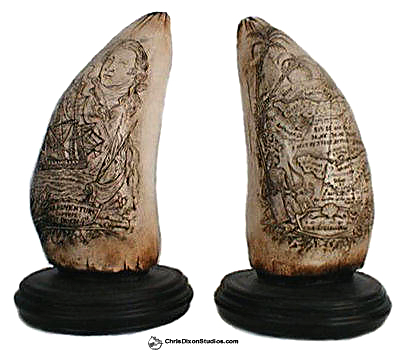 Details: Map scrimshaw tooth | Pirate, Captain Kidd scrimshaw tooth..
Nautical whale tooth scrimshaw replicas. These hand cast whale tooth reproductions reflect to the smallest detail, the painstaking and ancient art of scrimshaw. Unique nautical scenes are etched on to each one. The details are highlighted with lampblack pigmented oil paint as were the original antiques. Captain Kidd: The notorious pirate looks on his final sea battle as The US 'Adventure' captures his 'Quedah'. Treasure Map: This sculpture replica depicts a detailed map with latitude and longitude coordinates. Its location seems to be the Gold Coast of Africa! Includes descriptive hang-on cards. They make a nice gift, set of bookends and a fine addition to any furniture accessory collection. You may want to go on your own international nautical adventures with these replica antique scrimshaw treasures. Ancient mariners etched scenes on tooth, bone, horn, shell, wood, stone to create scrimshaw. Their painstaking engravings are better appreciated considering the use of only hand tools (or lack thereof) and harsh offshore conditions. The fine lines of these engravings were then filled with oil pigmented with lampblack to accent the finely carved details.